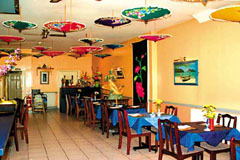 Dine in this bright and spacious restaurant surrounded by Thai artefacts and figurines with colourful umbrellas hanging from the ceiling. Talay Thai has now been established for 3 years and is a very popular venue for all occasions – a cosy dinner for two, a family party or business lunch. The menu offers a range of dishes with a wonderful variety of flavours – rich curries, tangy soups, stir-fried dishes of meats and vegetables and succulent seafood, to name but a few – all at very affordable prices. Open Tue-Sun noon-3pm, Mon-Sun 6-11pm. All major credit cards accepted (not Amex/Diners). No service charge. Prize-winner in the 1999 Thai Food Festival held annually in Battersea. Amazing food, good atmosphere. The staff were very friendly. I would definately return for another meal.